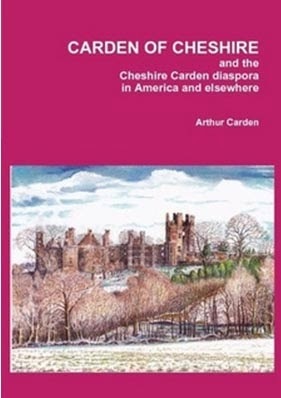 Visitors to www.lulu.com (put CARDEN in search box) will see that a new edition of Carden of Cheshire is now available. The revised front cover, reproduced here, shows a splendid painting by Marrion Carding of the ruins of Wingfield Manor. Marrion has discovered that in the sixteenth century William Carden was Keeper of Wingfield Manor for the Earl of Shrewsbury when Mary Queen of Scots was incarcerated there. There are several contributions by Carol Smith (née Carding), one of which shows that David Cawardyn was the first of our family to own Mavesyn Ridware, with its wonderful Carden tombs and hatchments, not Sir John Cawarden of Carden in Cheshire. There are comprehensive chapters on the Matlock, Winsford, Worcester, Bendigo, and Monmouth branches of the family.